2. Premises known as no. 13 St. Margaret's` Street, Bradford on Avon in the occupation of Richard Dowdle. 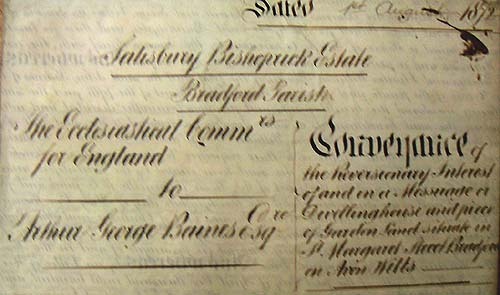 Deeds relating to properties in Morgans Hill, Nowhere Lane and St. Margaret's Street adjoining the Particular Baptist Chapel, Bradford-on-Avon, formerly part of the Bishoprick estates of the Manor of Monkton Farleigh and Cumberwell. Besides the mesne Lords of Manors in the Hundred of Bradford, there were others who, though not exercising any jurisdiction within the Hundred demanded fealty, and perhaps rather more substantial acknowledgements, from some of the tenants within the domain of our Abbess, The Manor of Cumberwell, for example, was held under the Barony of Castle Coqlbe, and Humphrey de Lisle (Hunfredus de Insula) the Lord of that Manor claimed from the tenant at Cumberwell-(in early times one named Pagen)-suit and service for the same The Prior of Monkton Farleigh, moreover, who held the Lordship of that Manor, claimed payment for lands in this parish :1 -there is in existence a deed (of the time of Edward I.) by which Walter Fayrchild of Wroxale grants to Alice la Loche, amongst other lands and tenements, some called II Clifcroft and Bradcroft, and a croft above Hanecleye paying 1Bd. per annum to the Lord Prior and Court of Farlege, viz., at Hockeday 12d. and at Michaelmas 1d. "1 To this day certain property in the town of Bradford is held under the Manor of Monkton Farleigh. A field called I the Conigre,'(one of several pieces of ground bearing that name in the parish) just behind the house occupied by Mr. Adye, in Woolley street, and some houses in St. Margaret street, nearly opposite the present Railway Station, are still held under leases granted by the lessee of "the Manor of Monkton Farleigh and Cumberwell," as it is termed. 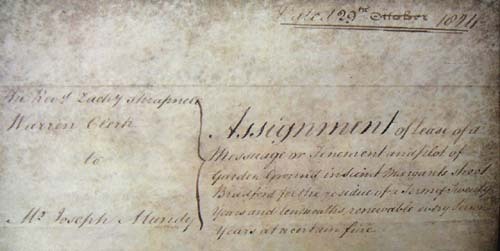 John Marreys and John Gore to grant a messuage and land in Slaughterford, Chippenham, Stanley, Langley Burrell, Cockleburg, Allington, and Estmede to the prior and convent of Monkton Farleigh, retaining messuages and land in Bradford and Melksham. Wilts. Thomas de Hungerford, knight, and John Marreys to grant the reversions of messuages and land in Farleigh and Farleigh Wick, now held by Peter Scot and Katherine his wife for her life, and by Robert Redyng and Isabel his wife for her life, and in Allington by Chippenham now held for life by John Buskyn, to the prior and convent of Monkton Farleigh, Thomas Hungerford retaining the manor of Heytesbury, and John Marreys a messuage and land in Bradford. Southampton: Monastic Possessions Possessions of dissolved religious houses. Possessions of the dissolved religious houses of:-- Hartley Wintney, St. Denys, Southampton (Southampton), Netley (Southampton), Quarr (Southampton), Mottisfont (Southampton), Breamore (Southampton), Maiden Bradley (Wilts), Monkton Farleigh (Wilts), Kington (Wilts), Stanley (Wilts), Easton near Burbage (Wilts), Ivychurch (Wilts), Bristol, St.
Zacahriah Shrapnel Warren said John Lutin as tenant. 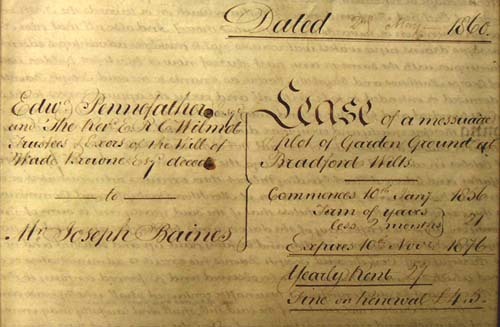 John Long of Tilshead Ldge & Joseph Mundy of Bradford Clothier , 1820 granted by Rev. 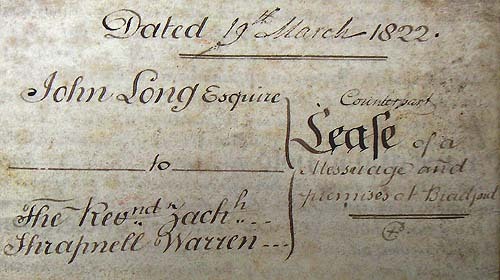 Zachariah Shrapnell Warren of Oakham , Rutland 20 year lease sum of £4 formerly in the possession of William Hood, but now in possession of Robert Barton N. Side and a house formerly in possession of Ebenezer Brown now Joseph Mundy on or towards south part , rent of 2/- to John Long suit & service to court of John Long kept in Manor of Monkton Farleigh and Cumberwell. 3,The priory of Farleigh held a small estate in Cumber-well, for which at the Dissolution it paid a rent of 3s 4d. to the Abbess of Shaftesbury. It is suggested that this may have been given to the priory by the Dunstanville family. This estate presumably became annexed to the manor of Monkton Farleigh (q.v.) and descended with it. 4. The manor of MONKTON FARLEIGH MANOR probably belonged in 1001 to Alfgar, whose landmark there was mentioned in a charter of King Aethelred. Other knd at Farleigh was given to the priory at different times by various donors. In 1397 Thomas de Hungerford and John Marreys granted the reversion of messuages and knds in Farleigh and Farleigh Wick, and Thomas Gore released to the priory all his estate in Farleigh Wick." The Prior of Farleigh was obliged to do suit at the court of the hundred of Bradford for this and other manors until 1227 when the Abbess of Shaftesbury released him from the obligation in exchange for a money payment. The priors held a court at Farleigh claimed gallows and the assise of bread and ale. also enjoyed free warren by charter of Henry III In 1293-4 Farleigh was in the hands of the king owing to the French war, and a survey of the manor was made. The manor was again in the kinng's hands in 1324-5, and must have been again taken in hand shortly before 1409-10, for in that year it was found by inquisition that the priory had been in the custody of Sir Walter Hungerford and William Stourton. In 1536 the manor was granted to Edward Seymour, Viscount Beauchamp, kter Earl of Hertford (1537) and Duke of Somerset (i$47).30 In 1545 Hertford transferred it to John Capon, Bishop of Salisbury.31 The bishop leased the manor in 1548 to Henry Britton or Breton, for ninety-nine years.31 Early in the reign of Elizabeth, Henry Britton was sued in Chancery for a customary tenement in the manor.33 In 1575 Henry's son George Britton was holding the manor, and in the same year the Bishop of Salisbury conveyed the lordship of Farleigh to the queen for eighty years, on condition that when the bishop or any of his successors wished 'to lie and abide at the said house they may for three months together in year during the said term possess and enjoy one hall, one parlour, one buttery and one pantry, one celkr or kitchen, one krder, one stable, and teA convenient lodging chambers, and as much fuel as shall be necessary'.34 Later in 1575 the queen transferred the lease of the manor to Thomas Smith, one of the clerks 'of the greencloth' of her household.35 The Brittons retained their tenancy of the manor until 1638, but in 1582 sublet the manor house to William Bromfield, of Lewisham (Kent), and before 1606 to the Cornwallis family. Between 1638 and 1654 the tenancy of the manor, under the Bishop of Salisbury, was held by the Cornwallises and William Whitwell. 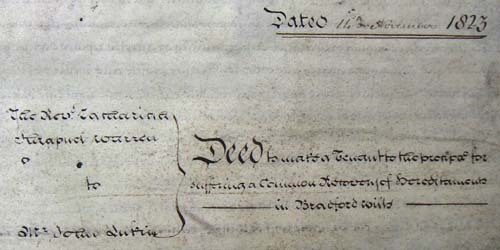 The lease to Thomas Cornwallis, of Wandsworth, was granted in 1638 for twenty-one years. Monkton Farleigh was sequestrated under the Commonwealth and was granted in 1648 to Willkm Bridges of Gray's Inn, Matthew Bridges, Brooke Bridges, and Francis Bridges.37 In 1653 the above grantees conveyed the manor to James Mayo and Francis Alkin.38 From 1654 the sitting tenant was William Watson, who died in i695.3» At the Restoration the manor was restored to the bishop and after Watson's death was held on lease by Daniel Webb of Seend from 1695 to I73I.40 John Thresher was lessee from 1731 to 1737. Daniel Webb's daughter Mary had married Sir Edward Seymour of Maiden Bradley, and in 1737 Sir Edward bought the lease of Farleigh/1 He became 8th Duke of Somerset in 1750, and on his death in 1757 the manor passed to his . second son, Webb Seymour, who became loth Duke in 1792, and died in the following year.41 The lease was renewed in favour of Anna Mark, relict of the loth Duke, who lived at Monkton Farleigh at least from 1799 until her death in i8o2.43 She was succeeded as lessee by Willkm Cass, of Poultry, London (i8o5~i2).44 In 1812 the lease was acquired by John son of Richard Long of Rood Ashton, on whose death in 1833 it passed to his son John. 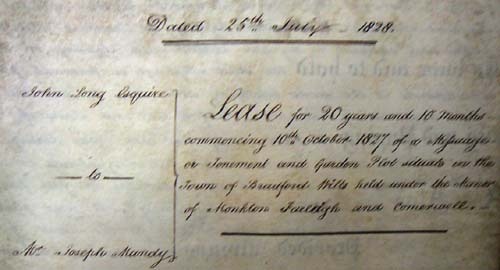 The Longs retained the lease until 1842, when it passed to Wade Browne, who was responsible for many improvements in the parish.After his death in 1851 Mrs. Wade Browne held the reversion of the lease and sublet to Edward Pennefather and the Revd. E. R. Eardly Wilmot. Between 1864 and 1870 the lessee was H. B. Caldwell.On Us death the Ecclesiastical Commissioners formed the manor into a freehold estate, and the part of it attached to the manor house, along with the house itself was sold in 1873 to Sir Charles Hob-house, bt. In 1882 the ownership of most of the parish was held by Sir Charles, Henry Spackman, and Henry Hancock.48 In 1939 the principal kndowners were Lady Hobhouse, Capt. E. C. Pinckney, and Major H. Whitehead. Monkton Farleigh manor is a krge house of irregukr pkn. The earliest part of the building, dating from the' 16th century, is on the west, built of rubble; all the mullioned windows have been renewed, and built in above their heads are carved 12th- and 13th-century fragments from the adjoining monastic site. Additions were made in the 17 th century, and in the first half of the 18th century extensive additions were made. (5)In course of time, nearly every one of the tythings into which Bradford was divided had its Lord of the Manor, each of whom held his court, at which the various tenants were required to do suit and service. We often meet in old deeds with references to " the court of Anthony Rogers, Esq., at Holte." In one of the documents found at the Hall, an account of which was given in [the Wiltshire Magazine] (vol. i. 290), of the date 1545, by which one ' Eichard Drewis of Holte' has certain lands ' in the Parke, Lowsly and Holes in Holte, and also a tenement in Little Holte' granted to him by lease, it is expressly added,-" to sue (i.e. to do suit) at Eogers's Court at Holte." 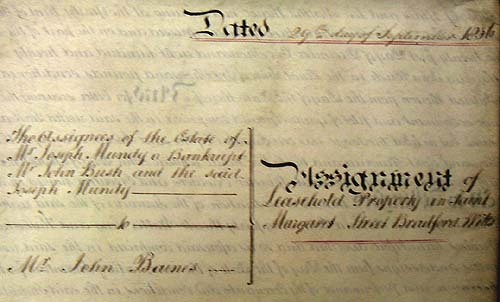 To this day, moreover, there is a payment due annually from the proprietor of the Manor House at Winsley, with which is held the Lordship of that Tything, of twenty-five shillings and eight-pence, to the Lord of the Manor of Bradford, a traditional acknowledgement of' the suit and service ' owned by him, as well as by all mesne lords, to the chief lord. (6)Alice la Loche, amongst other lands and tenements, some called " Clifcroft and Bradcroft, and a croft above Hanecleye paying 13d. per annum to the Lord Prior and Court of Farlege, viz., at Hockeday 12d. and at Michaelmas Id." To this day certain property in the town of Bradford is held under the Manor of Monkton Farleigh. A field called ' the Conigre," (one of several pieces of ground bearing that name in the parish) just behind the house occupied by Mr. Adye, in Woolley street, and some houses in St. Margaret street, nearly opposite the present Railway Station, are still held under leases granted by the lessee of "the Manor of Monkton Farleigh and Cumberwell," as it is termed.